How do I know what the PSI is set to on my airbrush compressor? My compressor is for my airbrush and it is really old but still in great shape! There is no dial on it to change the PSI setting. I’m starting to use it for airbrush makeup and i know it should be no higher than 15 for that. But I have no idea what it is! Its a small compressor so I’m thinking its not much more then that but how do I know for sure? You know for sure by installing an air regulator, with an air gauge, in the line from your compressor to your air brush. That regulator can be set for your 15 PSI, and, as long as the upstream air pressure is higher than that, your air brush should see a steady stream of air at the dialed in pressure of 15 PSI, or whatever pressure you choose to set it for. 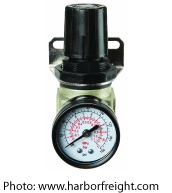 Low cost general purpose air regulators are inaccurate, sometimes by up to 5 PSI. If you need bang-on accuracy, you’d best look at a precision regulator. For that quality, be prepared to dole out a good bunch of books. Also, read the page on Regulators on this site for much more info about what these useful devices do for you, in particular, for painting applications.